Turkish police have detained hundreds of workers protesting over labor conditions at Istanbul's new airport, a giant project championed by President Tayyip Erdogan and due to open next month, a union leader said on Saturday. The protest broke out after a shuttle bus accident on Friday in which 17 workers were injured, said Ozgur Karabulut, general manager of the Dev Yapi-Is union. Thousands of workers joined the demonstration, which was broken up by police and gendarmes deploying in riot control vehicles and firing tear gas, he said. "They broke into the workers' camp with 30 gendarmerie, broke down the doors and detained around 500 workers," Karabulut told Reuters by phone. He said he was speaking from a local gendarmerie where he was seeking the workers' release. Opposition parliamentarian Ali Bayar, from the pro-Kurdish Peoples' Democratic Party (HDP), put the number of those detained at around 400. The workers' quarters "look like a detention camp...When we went there this morning gendermarie soldiers were still detaining workers," Bayar told Reuters. 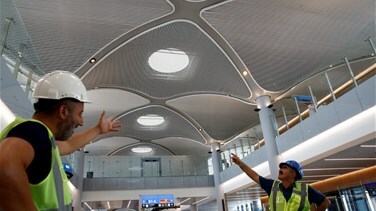 The new airport, which Turkey says will become the biggest in the world, is one of the showcase projects of a 15-year construction boom under Erdogan who has overseen building of bridges, ports and railways which have transformed the country. The growth has been fueled by cheap debt, however, and Erdogan said on Friday the government is freezing new investments to rein in inflation and support the lira, which has lost 40 percent against the dollar this year. The airport is scheduled to open at the end of October, but Karabulut said that was in doubt because the remaining work would take another two months. Unions have long complained about working conditions and labor safety at the airport, but under a state of emergency imposed after a failed 2016 military coup and only lifted in July, rights to strike or protest were curtailed. In February, Turkey's labor ministry said 27 workers had died at the airport since the start of work there in 2015, mainly from work accidents or health problems. Workers have also complained about poor food at the site, bed bugs in their sleeping quarters and delayed salaries. Pictures they posted online showed cracks in the ceilings and walls of the container homes where they are housed. Airport operator IGA said its CEO Kadri Samsunlu had met union representatives and was looking into their complaints. Karabulut said the union had received only verbal pledges from IGA and wanted commitments in writing. But he said many workers were unable to continue protesting. "Most of them had to go to work today under pressure and under threat," he said. "So they went to work today unwillingly but they want the public to know that they will be protesting tonight if their friends are not released."